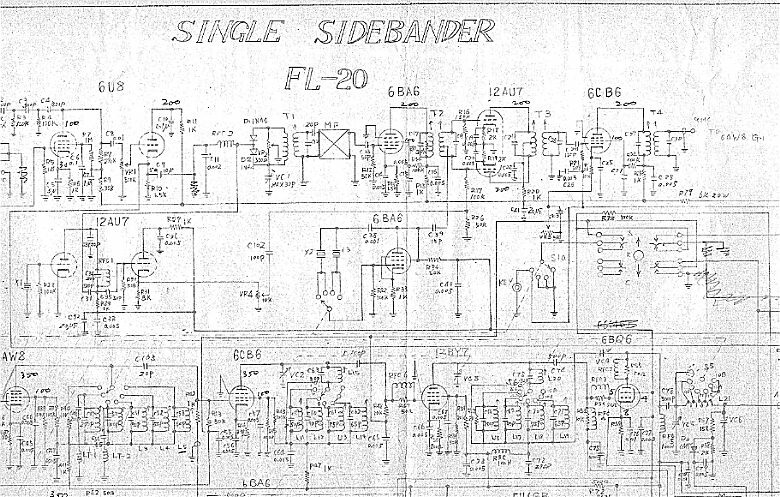 Shown below is part of the circuit diagram of one of Sako Hasegawa's first Yaesu Musen Co. products (the very first was in fact the model FL-10/40*), a 5 band crystal controlled 40 watt input HF SSB transmitter he called the FL-20. The partial FL-20 circuit above shows a 6BQ6 in the PA stage while the block diagram below indicates a 6DQ6 tube was used. 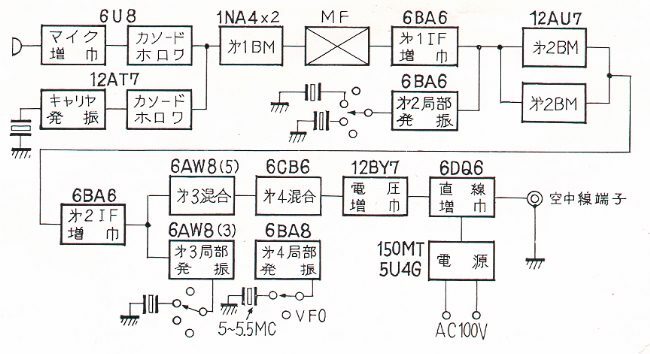 Although the block diagram was copied from an FL-20 advertising brochure, the author suspects that "6DQ6" is a typographical error. The crystal controlled FL-100 did however use the heavier duty 6DQ5 in its PA. 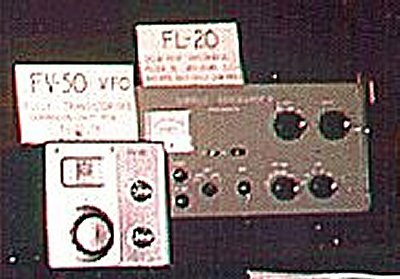 Shown at right is a rather poor photo of the first piece of Yaesu Musen equipment to be brought to Australia, Fred Bail's own FL-20. 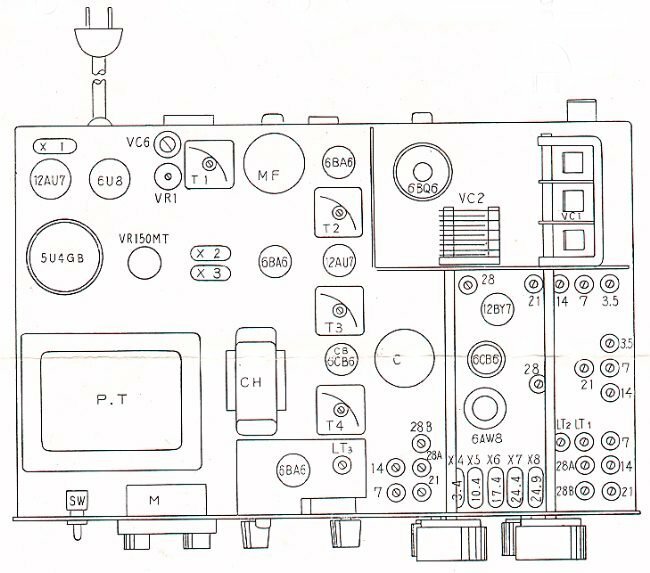 It is a later Mark II version and can be seen next to an FV-50 companion VFO for the FL-50 SSB transmitter. Although this photo was taken in May 1966 Fred had owned this FL-20 since 1963, having brought it back from Japan following a trip there. The author currently owns this particular original FL-20, the very first piece of Yaesu equipment to ever come to Australia as well as the only FL-20 ever imported into Australia to the author's knowledge. The photo above depicts a Mark II version of the FL-20, 20 watt PEP input HF, 5 band crystal controlled mechanical filter SSB transmitter. This is the same (apart from the small White knobs) as the first Yaesu Musen Co. transmitter to be brought to Australia by Fred Bail, VK3YS, for his personal use, in 1963. 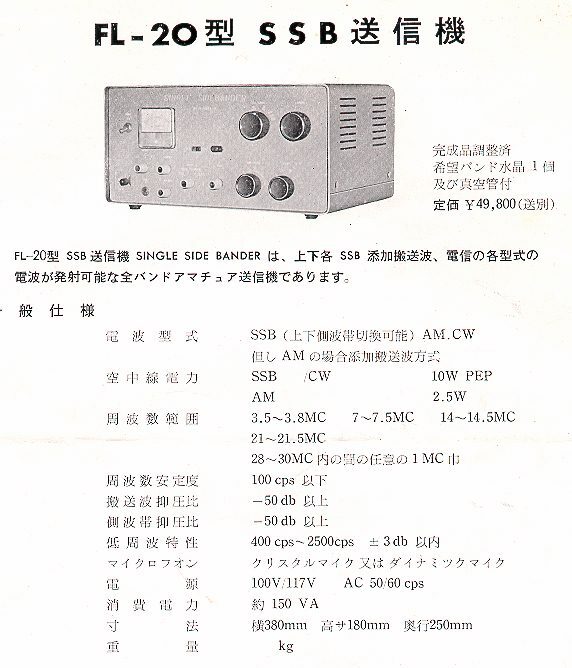 Shown above is an extract from an FL-20 advertising brochure giving general technical specifications of this early Yaesu transmitter. From the same FL-20 advertising brochure are, above, a drawing of the front panel layout and, below, a drawing of the internal component layout. Note that, unlike all later Yaesu valve equipment, which used solid state rectifiers, the FL-20 still used a valve rectifier (5U4GB) in it power supply. 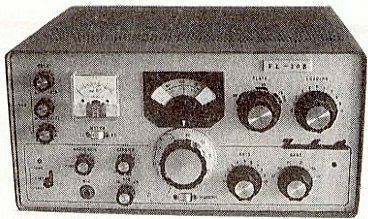 By the mid 1960's Yaesu Musen Co. had its F-Line on the market which, at that time, consisted of the FR-100B receiver, FL-200B transmitter and FL-1000 linear amplifier. Also, aimed mainly at the Japanese novice operator, was a powered down version of the FL-200B, the FL-20B. Shown at left, it used just one PA valve with much reduced voltage on it's plate to provide 10 watts PEP input power. 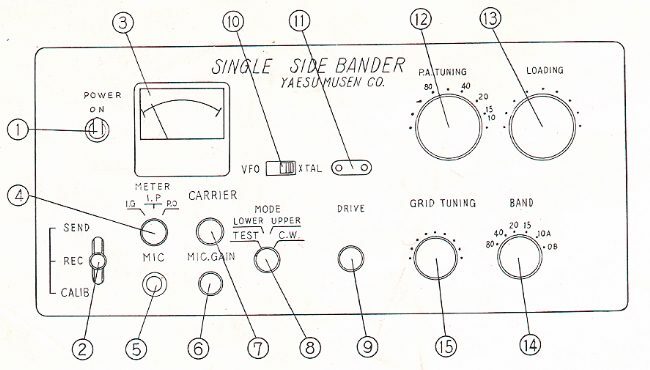 * The FL-10/40 was a monoband 40 metre 10 watt mechanical filter SSB transmitter, Yaesu Musen Co's first product. The author would be happy to hear from anybody who has very early Yaesu equipment, such as FL-20 Mark's 1 and 2, or FL-100B Mark's 1 and 2. 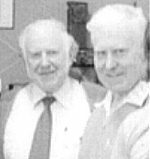 By way of some background information on the author, he was employed by Bail Electronic Services from the late 1960's through to 1977. Following this period he formed the company GFS Electronic Imports, GFS Electronics and then Portable Masts Australia Pty Ltd, of which he is a director today.